Mondlane had limited success lobbying the American government, which provided some moneys for refugee education to FRELIMO’s school in Dar Es Salaam through the auspices of the Ford Foundation. For Bobby Kennedy’s assessment of the leader, see Kennedy Dictabelts Conversation, 18B.3, Miller Center. 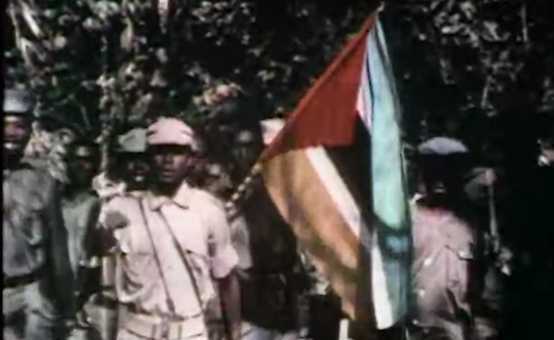 A Luta Continua was one of nearly a dozen films screened about the Portuguese and African revolutions created during this period. Many of these films depicted the socialist parties as models for emulation or as gaining victories for racial equality at the global level. A digitized version of the A Luta Continua discussion guide is available from the African Activist Archive. By French-African director Sarah Maldoror, dramatizes the Angolan Revolution and had regular showings throughout the country. Behind the Lines inspired Dutch filmmaker Ike Bertels to follow the lives of three female soldiers featured in the film from their years shortly after independence to the present. The result is a remarkable view of FRELIMO ideology and its impact on the lives of three Mozambicans. Clips and information are available on the director’s website. Among the many groups that took up action was the Pan-African Liberation Committee of Boston. The group was pivotal in helping to launch a national campaign in the black community against Gulf Oil, which was Portugal’s single largest foreign corporate partner in the 1970s. Information on them and their campaigns is available through the African Activist Archive.